I am a teaching and research academic with over 25 years experience. I have had the privilege of teaching hundreds of students at all levels of University from first year to higher degrees in mathematics, engineering and oceanography and presenting problems in a range of disciplines that benefit from mathematical modelling. My research interests are broad, covering all areas that can be modelled – which is surely everything! However, in particular I like to work in fluid mechanics and industrial/environmental modelling. I have published work on reservoir flow dynamics, flow of plastics, galvanizing of steel, design of ultrasonic nebulizers and flow in porous media among many other applications. and similar units through Open Universities Australia. I have also frequently delivered Honours units in fluid dynamics, industrial modelling, complex variables and asymptotic techniques. My research interests are spread across anything that can be modelled, which is surely everything. In particular, I work in the areas of fluid dynamics and industrial mathematics, including work on reservoir withdrawal dynamics, modelling of air-jet stripping during galvanising of steel, flow over obstructions, coating of solar panels, glacial flows, non-Newtonian fluids, rock fractures and explosions in mining applications. I regularly attend Mathematics-in-Industry Study groups, in which industry representatives propose problems that are discussed and modelled by the ensemble. I have attended such Workships in Australia, New Zealand, Ireland and South Africa – around 25 in total. These dynamic groups are highly interactive and grounded in getting to the heart of the industry problems. I am currently the co-Editor-in-Chief of the ANZIAM* Journal. 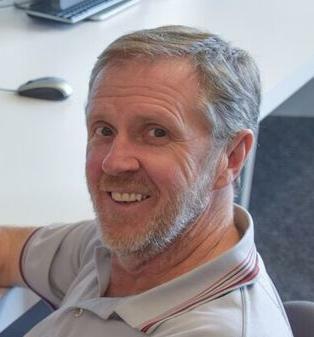 I am also a member of the executives of ANZIAM and the Australian Mathematical Society and the Chair of the Western Australian Branch of ANZIAM. I have been a moderator at a number of Mathematics-in-Industry Study Groups (in which we collaborate with industry to solve real problems) and have attended meetings of this type in Ireland, South Africa and Australia. For the last 15 years I have been a reader and assessor for the ARC and also an Associate editor of the Journal of Engineering Mathematics and a referee for a number of International journals in applied mathematics, engineering, oceanography, environmental science and nanotechnology. *ANZIAM stands for Australian and NZ Industrial and Applied Mathematics and is a division of the Australian Mathematical Society. The flow of water over obstuctions generates downstream waves. However, certain bottom shapes can work to cancel waves, thus removing a significant component of drag on the underwater structures. This project aims to compute flows and shapes which have this useful wave cancelling property. Water entering a reservoir that is stratified in density will plunge downward to the level of neutral buoyancy before intruding. Since intrusions can carry pollutants or salt, it is desirable to understand these flows to assist in management of the reservoir water release strategy to optimise water quality. Fresh water in tropical islands tends to sit in a lens beneath the ground and is a major source of fresh water. Extracting the water without drawing in salty ocean water is an interesting problem in porous media flow. Models of withdrawal for a range of island conditions will form the bulk of this work. Water left over from Desalination processes is often highly saline. Much of this water is returned to the ocean via long pipes. Due to its high salt content the water is very dense and sinks to the bottom where it can do significant damage to seagrasses and ocean life. In this study we will model the plume that is generated by this saline water with a view to optimizing the process and minimizing the damage. The retina is the part of the eye that captures images that are relayed to the visual cortex. The blood flow to this vital organ is essential in providing the required chemicals to conduct the necessary process. Lack of blood flow due to diseases such as diabetes can lead, in extreme cases, to blindness. In this thesis we will consider models of blood flow to the retina to compare with experimental data. Holmes, R., Hocking, G., (2017), A note on waveless subcritical flow past symmetric bottom topography,	European Journal of Applied Mathematics, 28, 4, pages 562 - 575. Hocking, G., NGUYEN, H., Stokes, T., Forbes, L., (2017), The effect of surface tension on free surface flow induced by a point sink in a fluid of finite depth,	Computers and Fluids, 156, , pages 526 - 533. Stokes, T., Hocking, G., Forbes, L., (2017), Unsteady flows induced by a point source or sink in a fluid of finite depth,	European Journal of Applied Mathematics, 28, 3, pages 357 - 379. Russell, P., Forbes, L., Hocking, G., (2017), The initiation of a planar fluid plume beneath a rigid lid,	Journal of Engineering Mathematics, 106, 1, pages 107 - 121. Omar, H., Hocking, G., (2017), Dense underflow into a lake or reservoir Sub-critical flow,	Applied Mathematical Modelling, 46, , pages 465 - 475. Omar, H., Hocking, G., (2017), Dense underflow into a lake or reservoir - Supercritical flow solutions,	Applied Mathematical Modelling, 42, , pages 449 - 461. Holmes, R., Hocking, G., (2016), A line sink in a flowing stream with surface tension effects,	European Journal of Applied Mathematics, 27, 2, pages 248 - 263. Hocking, G., Mitchell, S., (2016), A model of flow in a sugar diffuser,	IMA Journal of Applied Mathematics, 81, 6, pages 984 - 998. Hocking, G., NGUYEN, H., Forbes, L., Stokes, T., (2016), The effect of surface tension on free-surface flow induced by a point sink,	The ANZIAM Journal, 57, 4, pages 417 - 428. Fowkes, N., Hocking, G., Mason, D., Please, C., Kgatle, R., Yilmaz, H., van der Merwe, N., (2015), Models for the effect of rising water in abandoned mines on seismic activity,	International Journal of Rock Mechanics and Mining Sciences, 77, , pages 246 - 256. Hocking, G., Forbes, L., Stokes, T., (2014), A note on steady flow into a submerged point sink,	The ANZIAM Journal, 56, 2, pages 150 - 159. Hocking, G., Zhang, H., (2014), A note on axisymmetric supercritical coning in a porous medium,	The ANZIAM Journal, 55, 4, pages 327 - 335. Holmes, R., Hocking, G., Forbes, L., Baillard, N., (2013), Waveless subcritical flow past symmetric bottom topography,	European Journal of Applied Mathematics, 24, 0, pages 213 - 230. Forbes, L., Hocking, G., (2013), Unsteady plumes in planar flow of viscous and inviscid fluids,	IMA Journal of Applied Mathematics, 78, 2, pages 206 - 234. Hocking, G., Holmes, R., Forbes, L., (2013), A note on waveless subcritical flow past a submergedsemi-ellipse,	Journal of Engineering Mathematics, 81, 1, pages 1 - 8. Letchford, N., Forbes, L., Hocking, G., (2012), INVISCID AND VISCOUS MODELS OF AXISYMMETRICFLUID JETS OR PLUMES,	The ANZIAM Journal, 53, 3, pages 228 - 250. Hocking, G., Stokes, T., Forbes, L., (2012), Steady free surface flows induced by a submerged ring source or sink,	Journal of Fluid Mechanics, 694, 0, pages 352 - 370. Hocking, G., Sweatman, W., Fitt, A., Breward, C., (2011), Deformations during jet-stripping in the galvanizing process,	Journal of Engineering Mathematics, 70, 42795, pages 297 - 306. Hocking, G., Chen, S., Forbes, L., (2011), Withdrawal from the lens of freshwater in a tropical island: The two interface case,	Computers and Fluids, 50, 1, pages 175 - 180. Hocking, G., Forbes, L., (2010), Steady flow of a buoyant plume into a constant-density layer,	Journal of Engineering Mathematics, 67, 4, pages 341 - 350. Forbes, L., Hocking, G., (2010), Unsteady draining of a fluid from a circular tank,	Applied Mathematical Modelling, 34, 12, pages 3958 - 3975. Zhang, H., Hocking, G., Seymour, B., (2009), Critical and supercritical withdrawal from a two-layer fluid through a line sink in a partially bounded aquifer.,	Advances in Water Resources, 32, 2009, pages 1703 - 1710. Hocking, G., Zhang, H., (2009), A note on withdrawal from a two-layer fluid through a line sink in a porous medium,	The ANZIAM Journal, 50, 1, pages 101 - 110. Hocking, G., Zhang, H., (2009), Coning during withdrawal from two fluids of different density in a porous medium,	Journal of Engineering Mathematics, 65, 2009, pages 101 - 109. Hocking, G., Stokes, T., Forbes, L., (2009), A rational approximation to the evolution of a free surface during fluid withdrawal through a point sink,	The ANZIAM Journal, 51, , pages E16 - E36. Hocking, G., (2008), The effect of gravity on flow past a semi-circular cylinder with a constant pressure wake,	Applied Mathematical Modelling, 32, , pages 677 - 687. Forbes, L., Hocking, G., Stokes, T., (2008), On starting conditions for a submerged sink in a fluid,	Journal of Engineering Mathematics, 61, , pages 55 - 68. Stokes, T., Hocking, G., Forbes, L., (2008), Unsteady free surface flow induced by a line sink in a fluid of finite depth,	Computers and Fluids, 37, , pages 236 - 249. Hocking, G., Forbes, L., (2007), Unsteady draining flows from a rectangular tank,	European Journal of Applied Mathematics, 19, , pages 1 - 14. Hocking, G., Forbes, L., (2007), A note on the flow of a homogeneous intrusion into a two-layer fluid,	European Journal of Applied Mathematics, 18, 2, pages 181 - 193. Forbes, L., Hocking, G., (2007), An intrusion layer in stationary incompressible fluids Part 2: A solitary wave,	European Journal of Applied Mathematics, 17, , pages 577 - 595. Hocking, G., (2006), Steady Prandtl-Batchelor flows past a circular cylinder,	The ANZIAM Journal, 48, , pages 165 - 177. Forbes, L., Hocking, G., Farrow, D., (2006), An intrusion layer in stationary incompressible fluid: Part 1: Periodic Waves,	European Journal of Applied Mathematics, 17, 5, pages 547 - 575. Farrow, D., Hocking, G., (2006), A numerical model for withdrawal from a two-layer fluid,	Journal of Fluid Mechanics, 549, 0, pages 141 - 157. Forbes, L., Hocking, G., (2005), Flow due to a sink near a vertical wall in infinitely deep fluid,	Computers and Fluids, 34, , pages 684 - 704. Stokes, T., Hocking, G., Forbes, L., (2005), Unsteady flow induced by a withdrawal point beneath a free surface,	The ANZIAM Journal, 47, , pages 185 - 202. Hocking, G., Forbes, L., (2004), The lens of freshwater in a tropical island - 2d withdrawal,	Computers and Fluids, 33, , pages 19 - 30. Forbes, L., Hocking, G., Wotherspoon, S., (2004), Salt-water up-coning during extraction of fresh water from a tropical island,	Journal of Engineering Mathematics, 48, , pages 69 - 91. Hocking, G., Stokes, T., Forbes, L., (2003), Unsteady free-surface flow induced by a link sink,	Journal of Engineering Mathematics, 47, , pages 137 - 160. Forbes, L., Hocking, G., (2003), On the computation of steady axi-symmetric withdrawal from a two-layer fluid,	Computers and Fluids, 32, , pages 385 - 401. Hocking, G., Vanden-Broeck, J., Forbes, L., (2002), A note on withdrawal from a fluid of finite depth through a point sink,	The ANZIAM Journal, 44, , pages 181 - 191. Straskraba, M., Hocking, G., (2002), The effect of theoretical retention time on the hydrodynamics of deep river valley reservoirs.,	International Review of Hydrobiology, 87, 1, pages 61 - 83. Asaeda, T., Pham, H., Priyantha, N., Manatunge, J., Hocking, G., (2001), Control of Algal Blooms in reservoirs with a curtain: a numerical analysis,	Ecological Engineering, 16, , pages 395 - 404. Hocking, G., Forbes, L., (2001), Supercritical withdrawal from a two-layer fluid through a line sink if the lower layer is of finite depth.,	Journal of Fluid Mechanics, 428, , pages 333 - 348. Stokes, T., Hocking, G., (2001), On the optimal inner tube shape for an ultrasonic nebulizer,	The ANZIAM Journal, 43, , pages E37 - E74. Hocking, G., Forbes, L., (2000), Withdrawal from a fluid of finite depth through a line sink, including surface-tension effects,	Journal of Engineering Mathematics, 38, , pages 91 - 100. Zhang, H., Barry, A., Hocking, G., (1999), Analysis of continuous and pulsed pumping of a phreatic aquifer,	Advances in Water Resources, 22, 6, pages 623 - 632. Hocking, G., Straskraba, M., (1999), The Effect of Light Extinction on Thermal Stratification in Reservoirs and Lakes,	International Review of Hydrobiology, 84, 6, pages 535 - 556. Hocking, G., Vanden, B., (1998), Withdrawal of a fluid of finite depth through a line sink with a cusp in the free surface,	Computers and Fluids, 27, , pages 797 - 806. Forbes, L., Hocking, G., (1998), Withdrawal from a two-layer inviscid fluid in a duct,	Journal of Fluid Mechanics, 361, , pages 275 - 296. Zhang, H., Hocking, G., Barry, D., (1997), An analytical solution for critical withdrawal of layered fluid through a line sink in a porous medium,	Journal of the Australian Mathematical Society. Series B: Applied Mathematics, 39, , pages 271 - 279. Hocking, G., Vanden-Broeck, J., (1997), Draining of a fluid of finite depth into a vertical slot,	Applied Mathematical Modelling, 21, , pages 643 - 649. Hamilton, D., Hocking, G., Patterson, J., (1997), Criteria for selection of spatial dimensionality in the application of one and two dimensional water quality models,	Mathematics and Computers in Simulation, 43, , pages 387 - 393. Zhang, H., Hocking, G., (1997), Axisymmetric flow in an oil reservoir of finite depth caused by a point sink above an oil-water interface,	Journal of Engineering Mathematics, 32, , pages 365 - 376. Priyantha, N., Asaeda, T., Hocking, G., Saitoh, S., Gotoh, K., Iseri, Y., (1997), Application of a two dimensional model to predict the effects of the curtain method on algal blooming in reservoirs,	Annual Journal of Hydraulic Engineering, Japan Society of Civil Engineers, 41, , pages 415 - 420. Fowkes, N., Hocking, G., Kulesza, K., McKenzie, J., Mitchell, S., Myers, T., (2016),PROCEEDINGS OF THE MATHEMATICS IN INDUSTRYSTUDY GROUP,In: Proceedings of the Mathematics in Industry Study Group, South Africa, January, 2014. Stokes, Y., Miller, A., Hocking, G., (2016),Pressure drop in pipelines due to pump trip event,In: MISG2015. Hocking, G., Gibson, E., Mitchell, S., (2015),An energy efficiency index for the South African sugar industry,In: Mathematics in Industry Study Group. Hocking, G., Sweatman, W., Fitt, A., Breward, C., (2012),Deformations arising during air-knife stripping in the galvanization of steel.,In: Progress in Industrial Mathematics at ECMI 2010. Fowkes, N., Hocking, G., Please, C., Mason, D., Kgatle, R., (2012),RISING WATER TABLE AND SEISMICITY,In: PROCEEDINGS OF THE MATHEMATICS IN INDUSTRY STUDY GROUP 2012. Breward, C., Hocking, G., Please, C., (2012),MODELLING THE EXTRACTION OF SUGARFROM SUGAR CANE IN A DIFFUSER,In: PROCEEDINGS OF THE MATHEMATICS IN INDUSTRY STUDY GROUP 2012. Charpin, J., Hocking, G., Ali, M., (2011),OPTIMIZATION MODEL FOR CAMPUS PARKING SPACE ALLOCATION,In: Mathematics in Industry Study Group MISGSA 2011. Hocking, G., (2011),TRANSFORMING SOUTH AFRICAN SUGARCANEFACTORIES TO BIOREFINERIES,In: Mathematics in Industry Study Group MISGSA 2011. Hocking, G., Sweatman, W., Roberts, M., Fitt, A., (2010),Coating deformations in the continuous hot-dipped galvanizing process,In: Mathematics and Statistics in Industry Study Group (MISG) (2009). Hocking, G., Jakeman, J., Sexton, J., Wand, M., (2008),Tsunami risk modelling for Australia: understanding the impact of data,In: Mathematics-in-Industry Study Group. Hocking, G., Stokes, Y., Sweatman, W., (2005),Implementing Lanier's patents for stable safe and economical ultra short wing vacu- and para planes,In: Mathematics in Industry Study Group (MISG) Conference (2005). Fowkes, N., Hocking, G., (2001),Analysis of train wheel noise,In: Proceedings of the 2000 Maths-in-industry study group. Sciffer, S., Hocking, G., (2000),Optimisation of cavity formation and entrainment in deep submerged water jets,In: Proceedings of the 1999 Mathematics-In-Industry Study Group. Fulford, G., Hocking, G., (1998),Optimisation of an ultrasonic nebulizer,In: Proceedings of the 1998 Mathematics-in-Industry Study Group.